One of the key innovation in LibX 2.0 is the fact that there exists only a single download package for all users (independent of which edition they wish to use). After downloading this package, the user must then activate an edition, or an edition is automatically activated. 4 Upgrading existing LibX 1.5 users. If a user downloads LibX from the download page, no edition will be activated. Instead, a screen such as the one below is shown, where the user can search for editions and activate them. and replace ‘vt’ with your edition id. This will set the cookie on download, install LibX, which should then automatically activate edition vt. In this example, a maintainer has LibX Worldcat edition rev 4 installed (which was the live revision at this point), but was looking at the test page for revision 5. Upgrading existing LibX 1.5 users. We have patched LibX 1.5 to store the configuration locally. If you enable the 1.5 – 2.0 update in the edition builder, users will be directed to the LibX 2.0 plug-in (via the update.rdf mechanism). 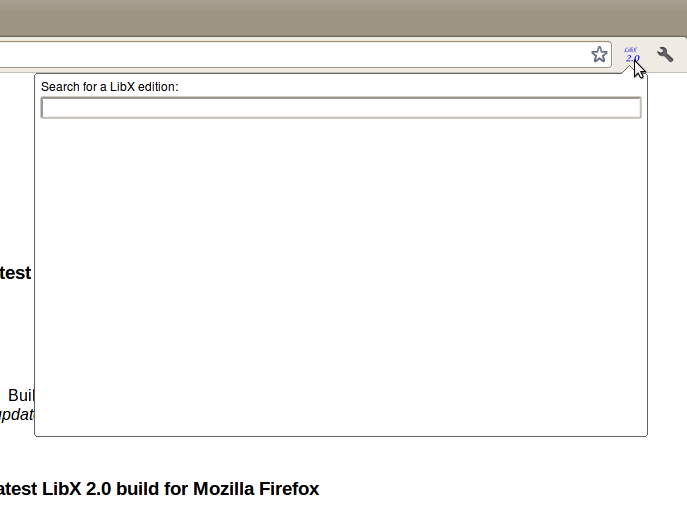 When LibX 2.0 starts up in Firefox, it will check if this configuration was stored, and should activate it automatically. It will fail if the edition has not been made live, i.e., if no live revision exists. In those cases, the user should manually activate the edition; feel free to contact us should the problem persist.